On January 20, 2009, with my feet frozen beyond the point of frostbite, my legs weary from standing straight up for hours on end, and my eyelids revealing every bit of the fact that I had been up since 4am that day, I stood in Washington, D.C. about 100 yards from the President as he took his oath of office. It was a great day. It was the culmination of many months of volunteering, phone calls to strangers, canvassing door to door, and countless hours of organizing people to get out and vote for America's first Black President. However, later that day after the nostalgia wore off and dreams transitioned into reality, a group of friends and I started to take bets on just how long it would take, exactly, before the very same Black Community leaders, who we saw celebrating Obama's presidency earlier that day, would turn around 180 degrees and curse Obama. We knew it was only a matter of time, but not because we thought the Black Community leaders here hypocrites or because Obama would flip the script or go back on his campaign promises. No, in fact, quite the opposite: we knew Obama would keep his campaign promises, and unlike those on the Left who seem to be shocked lately every time Obama announces another moderate policy decision, we actually listened (*gasp*) to what Obama said he was going to do during the campaign. We didn't believe Fox News, Sarah Palin, or the rest of the radical Right when they attempted to label Obama as "The Most Liberal Senator in the Universe" because, well, we can read. And we didn't get caught up in the hoop-la on the Left that fantasized about having their own Left-Wing version of George Dubyah Bush. None of the evidence supported any of that. What the evidence did show, to anybody who cared to listen, was that Obama was a pragmatic centrist/moderate liberal who would likely initiate policies aimed at helping all people, not just some people. That being the case, we knew that the leaders within the Black Community would eventually get frustrated with Obama and call him out for not catering specifically to the Black Community; the only thing we didn't know is how long it would actually take to happen. Our wait is finally over. This week saw 10 members of the Congressional Black Caucus withholding their support for an overhaul of the financial services industry because they felt that the administration wasn't being specific in addressing the effect of the economy on African Americans. The move caught the White House by surprise, and clearly brings out in the open the friction between the nation's first black president and a caucus he was a member of during his time in the U.S. Senate. The unemployment rate among African-Americans is nearly 16 percent, almost double the 9 percent rate for whites. Roughly one in four blacks lives in poverty, compared with about 11 percent of whites. Obama was a black caucus member in the Senate before winning the White House last year, but he has never had a close relationship with the group. In recent interviews, he has addressed their criticisms by saying he must represent the entire country, not any one population, and the best way to help low-income communities is to improve the overall economy. "I think it's a mistake to start thinking in terms of particular ethnic segments of the United States rather than to think that we are all in this together and we are all going to get out of this together," he said. 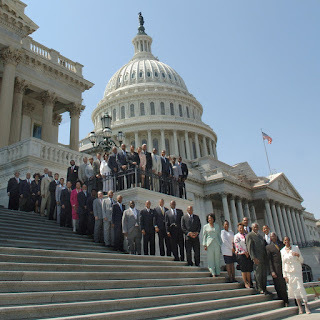 Many blacks in Congress take exception to that view, arguing that decades of neglect and discrimination warrant particular attention to minority concerns. Veteran black lawmakers such as Rep. Maxine Waters, D-Calif., and House Judiciary Committee Chairman John Conyers, D-Mich., have been among the most vocal. So now that all the cards are out on the table, I'm actually kind of torn on this one. On the one hand, the President raises a good point that he must be the President of the United States, and not just the President of the Black Community. However, on the other hand, the CBC raises a good point that there are, in fact, significant racial disparities in American unemployment and poverty that an equal-across-the-board economic policy will never solve. So who is making the better argument here? In other words, what do you think the President should do?